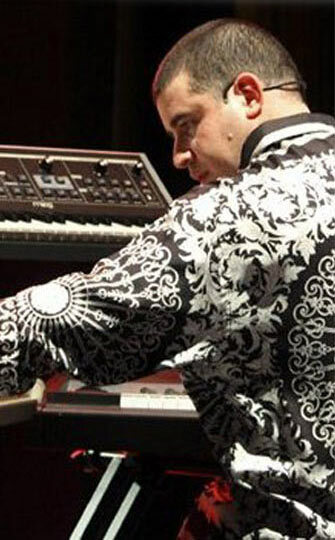 Jonathan Sindelman is an accomplished pianist keyboardist, programmer and composer well known for his contributions in contemporary music. Originally from Los Angeles, Jonathan was self-taught on piano, writing songs from the age of 5, and later an early demo of original compositions caught the attention of University of Oregon, leading to invaluable study and contact with such celebrated composers as Philip Glass, Krzysztof Penderecki and George Crumb. Jonathan has worked with a number of rock's leading lights, including Alan White (Yes, John Lennon, George Harrison, Plastic Ono Band), Mike Keneally (Frank Zappa, Joe Satriani, Steve Vai), Joe Travers (Zappa Plays Zappa, Duran Duran, Billy Idol), and Turn On Red – a jazz fusion collective that has recorded and performed with such luminaries as Mike Keneally and Grammy winning guitarist Frank Gambale (Chick Corea/Return To Forever). Additional collaborations between studio and stage include members of Heart, Queensrÿche, Blues Traveler, Zappa Plays Zappa (Scheila Gonzalez, Ben Thomas, Pete Griffin & Jamie Kime), Marc Bonilla (Keith Emerson Band, Ronnie Montrose, California Transit Authority), Kris Meyers (Umphrey's McGee), John Ziegler (Volto), Lee Oskar, Tracy Bonham, Neal Morse, Randy George (Mike Portnoy, Neal Morse), Chris Quirarte (Redemption), Johnny Bruhns (Circa, Yoso, Billy Sherwood), Dave Meros (Spock's Beard), Geoffrey Castle, and Kim Steinberg (Magic Pie).